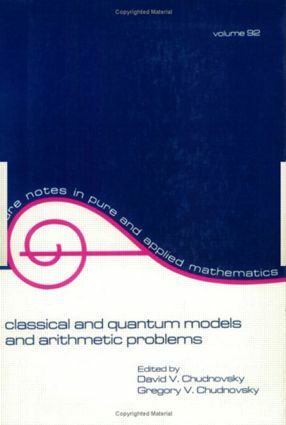 Here is an unsurpassed resource-important accounts of a variety of dynamic systems topicsrelated to number theory. Twelve distinguished mathematicians present a rare complete analyticsolution of a geodesic quantum problem on a negatively curved surface … and explicitdetermination of modular function growth near a real point .. . applications of number theoryto dynamical systems and applications of mathematical physics to number theory . ..tributes to the often-unheralded pioneers in the field … an examination of completely integrableand exactly solvable physical models .. . and much more!Classical and Quantum Models and Arithmetic Problems is certainly a major source of information,advancing the studies of number theorists, algebraists, and mathematical physicistsinterested in complex mathematical properties of quantum field theory, statistical mechanics,and dynamic systems. Moreover, the volume is a superior source of supplementary readingfor graduate-level courses in dynamic systems and application of number theory .